With a lacework that binds the vastness of the universe to endless depths of the ocean, local artist Shaylen Broughton constructs the depths of human awareness. “A lot of people ask me if I could be any place and time, what would I be? I say I would be the ocean in the winter, this place of total peace of mind, vast and nothing in the way. It’s hard to explain why, I feel connected to the solitude of the ocean,” she said. 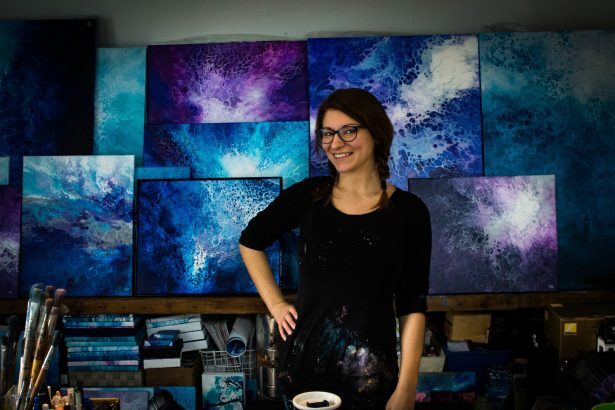 Recently featured at Fresh Richmond’s First Fridays pop-up, Broughton unveiled her latest series, Undercurrent; a form of Abstract acrylic based fluid art that has marked her splash onto the Richmond art scene. Broughton utilizes her dichotomy of crafts – thoughtless abstract paintings with the dry confines of business education– to develop a brand still unbeknownst to a booming yet competitive Richmond art community. Each piece webbing its own constellation of blue hues— a scope into the unconscious depths of human emotion, but also a medium to the interconnected affinity bridging the ocean and stars. Her methods, she assures will always stay her own; an endless conquest against the rigidity of creative limitations. Broughton explores the possibilities of where her work will lead, a frame for the expedition she embarks on in her own mind. Along this bridge, Broughton leads a search for the treacherous serpents many artists fail to see beneath the canvas, lurking in the depths below. A native of Ashland, Broughton began learning art at a young age, taught watercolor painting by her grandmother. These seeds led to aspirations for artistry. Broughton continued her passion into early adulthood, only stopping for her time at Savannah College, ironically one of the most prestigious art schools in the country. Though she wasn’t working on any major projects while in school, it is here in Savannah that Broughton began to draw inspiration for her future works. “I began doing fluid art with the inspiration being the ocean during my time at Savannah, the abstract nature of water kind of drew me to this type of work, and gave me a piece of mind,” Broughton said. Her degree completed, Broughton and her husband returned to Richmond. Still determined to make it as an interior designer, Broughton continued working as freelance space planner post-college until she began a career in hotel design with Baskervill Design. Broughton’s fascination with the effects of design initially pushed her to make this work out: “…the effects of spacing, colors, and lighting on how people feel is quite intriguing to me.” But the gleam of the career was less than Brought anticipated. Her departure from Baskervill would be the pivoting point traced back to the Georgia sand. She began to realize the value in her own creativity as the sole reference point; the same passion since childhood, the spark to her creations. “I was let go of Baskervill, to which I wasn’t exactly upset, I understood why, I wasn’t happy there, it wasn’t where I wanted to be,” Broughton said. Making the necessary steps, a new career path was taking shape. “I continued to paint and grow on social media, I made a site and a blog for my work.” Broughton put sole focus on growing via social media and making commissions. She reached out to other artists in the community, including Hamilton Glass whom she said essentially helped her jump into the Richmond art scene. Broughton spun onto the scene, networking with countless artists that knew Glass and in related events, from teaching summer classes with Art on Wheels, live paintings at the James W. Black Music Center here in Richmond, to kids crafts at the Richmond Folk festivals. Each of her pieces she creates uses an acrylic base of paints, colors handpicked to engulf its viewer down a whirling abyss, yet raise them with heft towards the cosmic web above. Usually aboard a foundation of canvas or wood, Broughton uses water from the ocean in both her acrylic work as well as her watercolor works. “Never more than 20 percent in the acrylic so the binders in the paint are still very stable, I just really like the idea of actually incorporating a piece of nature into my artwork,” she said. This is how, as Broughton puts it, “to truly achieve fluid art”. And that’s just the tip of the iceberg. Broughton’s work dwells in the realm of Jungian psychology. “I read up on Carl Jung who has definitely influenced my work,” Broughton said, “I feel the importance in my work is through expressing feelings or ideas held in my subconscious, often stuck in the unknown,” she said. When asked what makes an artist relevant, especially here in the Richmond community, Broughton emphasized the importance of embracing the community but also going a bit further with their work to meet their audience on a deeper level. “Embracing the community around you without changing yourself to mesh with it, and not being afraid to go up to strangers and introduce yourself is all crucial to success… but also connecting with the audience on a deeper unconscious level, and this goes for all types of art, regardless of the artist,” she said. Broughton has work available at Orange Richmond in Scott’s Addition as well as in the Artspace Gallery Shop. While upcoming features are still in the works, she is available online at sabartstudio.com. Follow her on Instagram sabartstudio for more pictures of her work and further updates.